The world of Bitcoin games is definitely getting more varied with new Bitcoin gaming sites emerging and the old ones launching new features and other gimmicks to get everyone engaged and stimulated. Generally, it is good news that more start-ups are being launched as this only shows how Bitcoin’s usage is improving over time. With online gambling, it is even better that cryptocurrencies like bitcoins are given the chance to be used and experienced to improve each one’s gambling practice. To cut to the chase, here are some Bitcoin sites to deliver same fun, same features, maybe even more. This one is really new. It was launched this month and it seems to be getting warm reception from initial players. The concept of BTC-Jockey is simple: a horse racing game between 2-4 players. Unlike other Bitcoin gaming websites, players at BTC-Jockey compete with one another rather than with the website. Freebies are not hard to come by at BTC-Jockey. As soon as your balance runs out of funds, you will be automatically credited with 200 satoshi into your account. If you’re on a training mode, you’ll be entitled to have 500 satoshi as your training bonus. If you’re a new player, you’ll get 10,000 satoshi for free. This Bitcoin poker site also debuted this year. Despite being new in the industry, Sky High Poker has a lot of potential that it really has a good chance of staying prolifically in the community. During its initial phase, games can be played for free and though it gives the impression that it only offers poker, players will be surprised to know that other games are up for grabs, too, such as blackjack and roulette. Other games available are Jacks or Better, Texas Hold’em, and Omaha. Still relatively fewer compared with established websites, but they are already established and Sky High Poker is still in the process of getting there. One strong asset it may have is its Bitcoin exchange-like feature, in which players in the site are allowed to purchase bitcoins through the website itself. 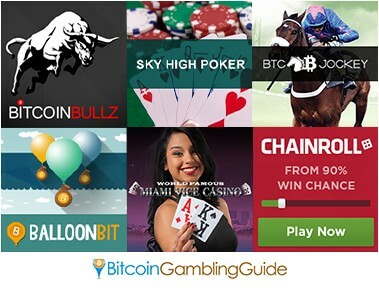 There’s some fierceness in the air with the new Bitcoin gaming site BitcoinBullz. It’s still in the onset of development, thus, players can only expect that there will be more about BitcoinBullz that is worth a try. So far, it already has installed features usually associated with Bitcoin usage such as anonymous playing and fast transactions of deposits and withdrawals. The game itself still needs improvement, which BitcoinBullz is already doing. Those who want to try the game here should wait a bit more. The creativity that fueled the development of this game cannot be overlooked. BalloonBit, certainly, has one of the unique games the Bitcoin gaming industry has ever had. Presented in 2014, it already has significant followers who became easily hooked with the adrenaline-pumping game instigated by popping balloons and progressive winnings. Everything here is ideal – the nice-looking website, genuine game, instant transactions, anonymity, low house edge, provably fair system, and the excellent customer support. It’s like paradise on earth, just with more balloons and bags of bitcoins. A freshly-made Bitcoin dice platform, Chainroll was recently introduced this month as well. Its website looks simple yet sleek and should create a nice impression among players. Since it is just beginning to make its brand known to dice enthusiasts out there, Chainroll has still a lot of things to show and prove. Clearly, it is doing great things already by giving out free bitcoins. Firstly, 0.0002 BTC is up for grabs every day. They’ll send you the said BTC amount every day in a period of 10 days. Secondly, 1 mBTC is also given for free to those interested. Players will be asked to follow Chainroll on Twitter. Afterwards, players can send their Bitcoin address to the same email address with their Twitter account to get the reward. The last in the list but certainly not the least, Miami Vice Casino aims to make it big in the Bitcoin casino industry. With its latest offerings and features, it is reasonable to assume that it stands a great chance of hitting its target. Aside from its variety of games and excellent features, Miami Vice Casino also does not forget to include fun bonuses and promotions that come in the form of welcome bonuses reaching up to 100%.